Guaranteed Lowest Prices Including Shipping - Anywhere On The Internet! Old House Borers can be found all along the eastern and western coastlines of the United States. They are very prominent from Louisana to Florida up through the Ohio Valley and into Rhode Island and Delaware. They are also found from Southern Texas up through Washington state. Old House Borers are also known as “long-horned beetles.” The adults can be brown to grayish black in color and are flatter in appearance than other beetles. Their wing covers feature small white lines and directly behind the head are two shiny segmented areas with thin antennae that can be as long, or longer, than the beetle itself. The typical length of an adult Old House Borer is anywhere from 5/8 of an inch to 1 full inch. You can generally identify males from females due to their size. Adult males are generally smaller than the adult females. Old House Borer larvae feature rounded heads, which are larger than their tails. They are cream colored, often a grayish white, and feature dark mandibles and three eyes on each side of their head. Their eyes make Old House Borer larvae easy to identify because no other long-horned beetles have larvae that contain more than one eye on each side of the head. Old House Borer larvae can be over 1 inch in length when full grown. Old House Borers belong to the Cerambycidae beetle family. This is the family of beetles that are commonly referred to as the “long-horned” beetles. There are more than 20,000 species that make up this family of insects. The majority of these pests are from the Eastern Hemisphere. 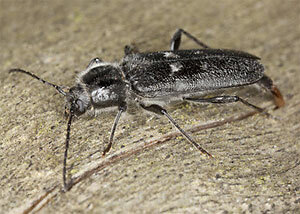 The trademark of the Cerambycidae beetle family is the long antennae found on each species. While Old House Borers are known as wood boring insects because they bore themselves into and feed on wood, not all of the beetles belonging to the Cerambycidae family do this. This is what makes Old House Borers and their wood boring relatives the more serious pests of the family. 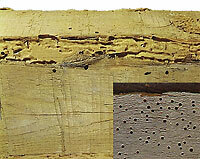 Old House Borers prefer to feed on soft woods…particularly stored lumber. This makes it easy for the pests to infest homes from the “minute” they are first built. Old House Borer larvae actually do most of the damage to the wood. They create large cavities of damage inside the wood filled with sawdust called "frass". Old House Borer damage to wooden beam. Inset picture has adult old house borer exit holes. These exit holes are 1/4 inch to 3/8 inches wide. Adult Old House Borers will emerge from infested wood during the late summer months, usually July or August. Once they have emerged, they will mate and the female will find crevices or natural cracks in untreated wood to lay her eggs in. Once the eggs have been laid, it will usually only take them a week before they hatch. 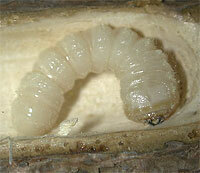 After hatching, the larvae bore into the wood surrounding them and begin feeding. One adult female has the ability to lay 200 eggs. Once the larvae begin to feed, they will continue to feed until they weigh approximately 200mg. It can take anywhere from 2 to 10 years for Old House Borers to mature. Once the larvae reach the weight of 200mg, they begin to make their way to the surface. The tunnels mature larvae make as they go to the surface are oval shaped and contain tightly packed frass. The larvae pupate in the pupil chamber just below the exit hole. Once an adult has mated, it will only live for 10-15 days. Old House Borers prefer soft woods such as fir, pine and spruce. The most common wood to find Old House Borers in is the lumber found in lumberyards, especially if it has been outside during the late summer months when adult beetles mate and lay eggs. 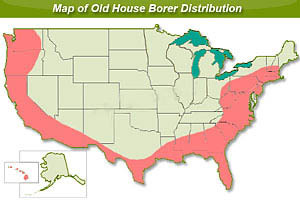 In the United States, Old House Borers can be found in eastern states from Florida up to Maine and in western states from Texas extending up to Michigan and anywhere in between. Most of the time, homeowners aren’t aware that they have an Old House Borer infestation until they discover the exit holes the mature adults leave behind. These holes are generally 1/4-3/8 of an inch in diameter. If you find an exit hole, you will also find small frass pellets near the exit holes as well. In most cases, homeowners know they have an active infestation because they can hear the mature larvae feeding within the wood. Most often, infestations are localized to one area, but this isn’t always true. If you have areas within your home that are poorly ventilated and collect moisture easily, the infestation will expand and can cause a lot of damage. Moisture control combined with a direct spray such as Totality or a wood preservative treatment such as Bora Care should be the first line of defense against this aggressive pest. In situations where moisture control cannot be implemented, removal of the infested wood along with replacing the wood with "insect and mold resistant wood" or borate treatments with Bora Care should be considered. Lumber containing the chemical "creosote" is no longer available, but some of the newer wood preservatives that turn the wood green and are sold as "treated" lumber can help to ward off invading old house borers. Hardie Wood sold by the James Hardie company is basically a cement fiber based wood replacement that is excellent for replacing infested wood and siding. Spot or localized treatments of infested wood can and will sometimes resolve the infestation. Direct wood treatment using a product such as Totality, Termidor, Phantom or Premise can be effective as long as the wood is not sealed. You can also sand and varnish wood that hasn’t been infested. This will smooth over any crevices the wood may have had, which will prevent the Old House Borers from laying their eggs. Another good way to treat your wood is by spraying it with a borate-containing surface spray such as Bora Care. This makes it impossible for larvae to enter the wood upon hatching. However, if you choose to spray the wood with a borate-containing spray, you should be aware that this method won’t work for wood that has been waxed, sealed or varnished. One of the underlying problems with direct wood treatment is that NONE of the available old house borer control products will penetrate through stain, paint or varnish. In almost all situations where direct wood treatment is desired, unless the wood can be removed to expose an unfinished side, the wood must be sanded down to bare wood to allow the product to penetrate. Spraying any of these water based products on top of the finish will result in the wood insecticide or preservative beading up and rolling off just like water. The good news is that after sanding the wood and proper application of the pesticide has been made and the wood is dry, paint, stain or varnish can then be applied as desired. In some situations, the wood can be injected with pesticide with a wood injector such as the crane needle injector. The wood must be drilled with a small drill bit into the "galleries" where the old house borer larvae are feeding. The insecticide can then be injected to kill the beetles directly. Injection through the exit holes will not work since those holes are basically "old" and the beetles have already escaped. Any type of localized treatment for Old House Borers should always be followed with regular inspections for new "exit" holes to determine if the infestation has spread or was never totally eliminated in the first place. In many cases, a regular regimen of Old House Borer inspection, wood replacement and wood treatment is necessary until all infested wood can be eliminated or treated within the structure. 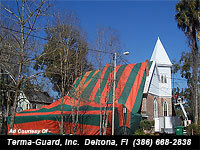 Fumigation involves wrapping the structure in gas tight tarps and releasing a fumigant such as "Vikane" inside. The entire process takes about 2 days and is usually 100% effective in killing all pests withing the structure. Fumigation is the only way to completely kill all Old House Borers infesting your home or structure. It is important to note that fumigating an entire building can become quite expensive, costing thousands of dollars. The benefit of fumigation with fumigants such as "Vikane" are that the adult beetle and mature larvae forms of infestation can be totally eliminated with one treatment. However, be forwarned that the old houses borer eggs are not easily killed. This is because the old house borer egg has a watery covering. Vikane does not penetrate water very well. With the use of "Vikane", (the only currently available structural fumigant), the requirement is that 10 times the amount of Vikane gas has to be used to kill the eggs as it does to kill the adults and the mature larvae. This is called a "10X" rate of gas in the fumigation industry. To use 10 times the amount of gas to kill the eggs as it takes to kill the adults is very expensive and not always successful. For this reason, if you decide to use a structural fumigation company, be sure that they have a rock solid reputation and will guarantee to "re-fumigate" if necessary at no additional charge. If you are building a new home or structure, you should make sure that the lumber you are using to build your home has been kiln-dried and not left outdoors during the late summer months. When building a new home, make sure that there is a warranty from the builder or a wood supplier against old house borers. Refrain from using old lumber that may have been infested at another location. Don't build old house borers into your home. Do not use wood that hasn’t been stored and dried correctly. Keep the wood moisture levels below 13% by using 4-6 ml of polyethylene on the soil under pier and beam structures. Increase ventilation in damp areas, make sure that there is adequate air inflow and outflow to help carry moisture away. Always inspect and look for signs of "exit holes" and signs of damage. Any exit holes or damage should be thoroughly investigated. 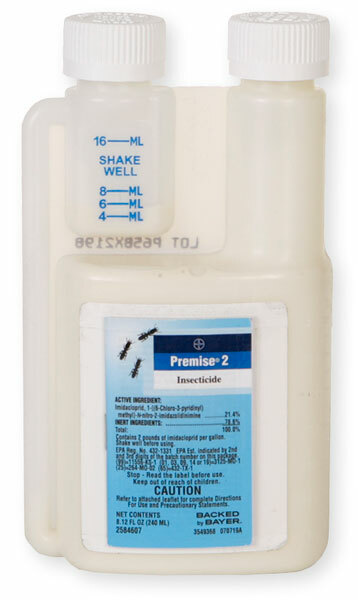 Treat for old house borers at the first sign of any infestation.